Our first talk of 2019 is at 7.30pm on Thursday 28th February at the WI Hall, Lowdham. 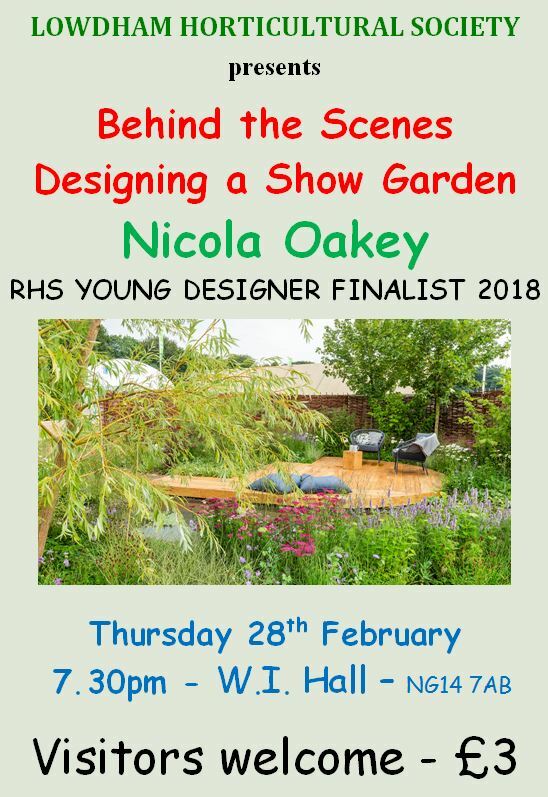 We will be visited by RHS Young Designer Finalist 2018, Garden Designer and Writer, Nicola Oakey. Nicola designed her first show garden at Tatton Flower Show in 2018, entitled ‘Raised by Rivers’ and was awarded a Silver-Gilt medal. We are very lucky to have her visiting us at Lowdham, when she will be sharing her experience behind the scenes designing a show garden. 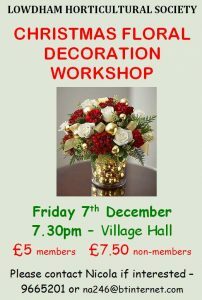 All are welcome and there is a £3 charge to non-members. Please spread the word to anyone that you think might be interested as it would be great to have a good turnout! 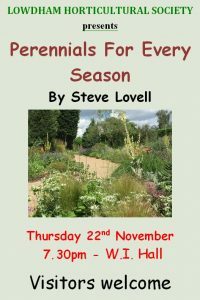 Many of you will have noticed on our programme, that we planned to visit the National Trust Winter Garden at Dunham Massey, Cheshire, early in March. I have been in email contact with them since last July, trying to book our visit, but unfortunately, they would not take bookings that far ahead. When I finally got to the stage of discussing a date with them, I was told that they do not take group bookings on a Sunday as the gardens are too busy at this time of the year! I found this very frustrating as I am not sure why they didn’t tell me this back in July! Apologies anyway. I am looking to see if there is somewhere else more suitable to book in March and will keep you posted if I find anywhere. On Sunday 12th May, will be visiting the RHS Malvern Spring Festival, Set against the magnificent Malvern Hills, their spring festival is packed with flowers, food, craft and family fun. 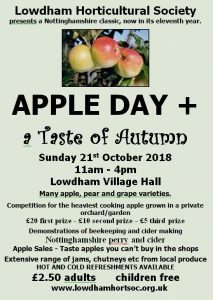 We will be leaving Lowdham at approximately 8.30am and travelling there by coach, where we can spend the day exploring the show. 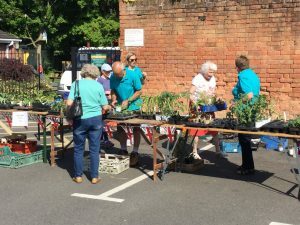 We have been before and it is a great, busy day out, with so much to see and buy if you want to! We anticipate this being a popular trip, so please book early if you would like to join us. All are welcome and the cost of the trip is subsidised at £32 to members and £35 to non members. 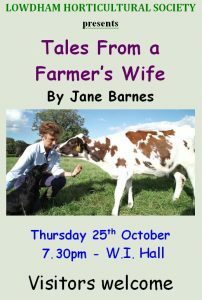 This price covers both the transport and entry to the show (which is £21 to the public). Counting down the days until Summer Show Day! Hope you are all busy getting your entries organised. If you have completed your entry forms feel free to pass them on to Janet or I before the day, then we can have your class cards prepared. If you are happy to complete your own please contact Janet 9669467 for your entry number and to collect some blank cards. Any filled out before the morning helps as it gets a bit manic at times and we struggle to write fast enough! 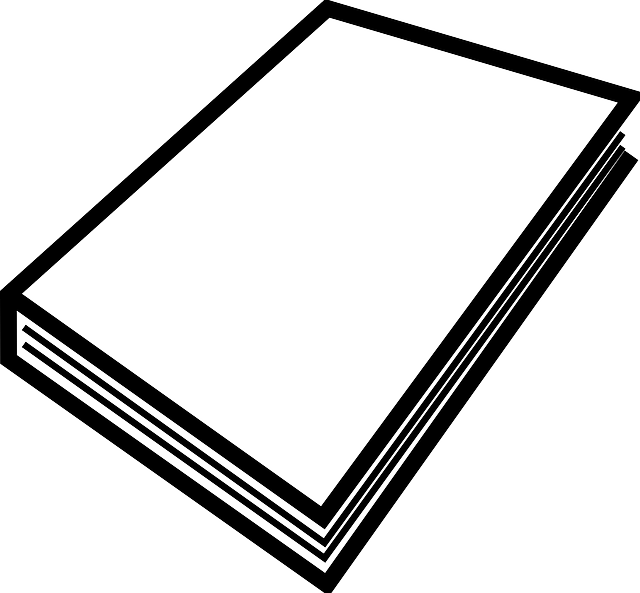 Remember the schedule and entry forms can be downloaded on our website. I have put together a rota for Show Day, but if any of you have an hour or two free and would not mind helping out on the gates, on a stall or with refreshments please let me know ASAP. We are setting up the marquee at 2pm on Sunday 26th August and help with this is always appreciated, so too is help at the end of the show on Monday, clearing up, when we have all had enough! If anyone has time to make home made cakes for the refreshments we would be most grateful. I have put together what I hope you think will be an exciting programme of talks and visits for 2018/19 and remind you that that Show Day is the ideal time to renew your LHS membership, a bargain at only at £10 each. We have 3 planned coach trips for 2019: Dunham Massey in March to see their winter garden, reputedly one of the best in the country; Malvern Spring Show on Sunday 12th May and a return visit after 10 years to Trentham Gardens, Staffordshire on Sunday 22nd September.